Grows in almost every sort of moist or dry, disturbed or undisturbed area, including upland forests as well as swamps (hardwoods, cedar, tamarack), especially along borders and trails (and old logging roads), in clearings, and after logging; roadsides, parking lots, campgrounds, recreation areas; fields and meadows, along rivers and streams, in fens; on rocky outcrops including limestone pavements. Native in Eurasia and also in North America, although some thoroughly established weedy variants are presumably introduced. Some strains have a creeping habit that appears adapted to a lawn environment. While stems of such plants may be only a few cm tall when flowering, on favorable sites plants may be 0.5 m tall. 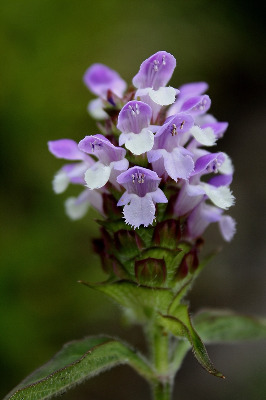 Unlike most mints, Prunella is not aromatic, but long ago it had reputed medicinal properties. It is too aggressive to be popular in most gardens. The corolla is normally blue-violet (or even pinkish), but white-flowered plants [f. albiflora Britton] are occasional throughout the state. The middle lobe of the lower lip is fringed. Blephilia ciliata might be superficially confused with Prunella because of the broad, conspicuous floral bracts, but that species has entire corolla lobes, 2 stamens, all 5 calyx lobes well developed and more densely ciliate, and paler flowers. MICHIGAN FLORA ONLINE. A. A. Reznicek, E. G. Voss, & B. S. Walters. February 2011. University of Michigan. Web. 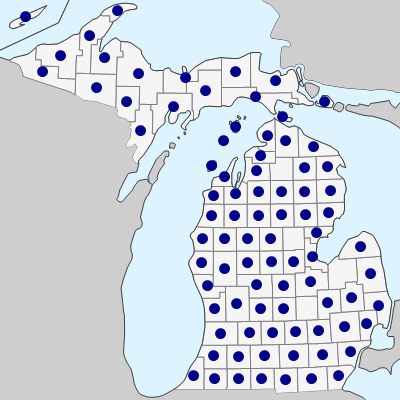 April 21, 2019. https://michiganflora.net/species.aspx?id=1580.